Its an oldie but a goodie, the Vision Board exercise. Sometimes called a Vision Collage, Dream Board, Treasure Map, Vision Map, etc. A wonderful, visual way to help define and align with what you really, really want for yourself in the future. In the movie The Secret (introductory movie on Law of Attraction principles), there is a scene where a man unpacks and shows his Vision Board to his young son, only to realize that he is now living in the house that was pictured on his Vision Board (created several years prior). And, during one of Oprah’s recent shows on The Secret, guest Lisa Nichols showed her Vision Board. In it were the words ‘Lisa Reveals All On Oprah’. She definitely manifested that one! 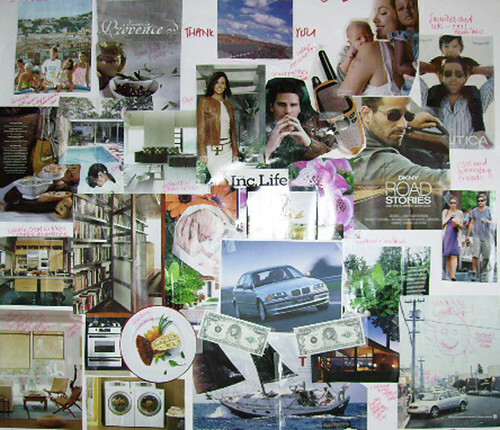 Vision boards help you define and get clear about what you desire for yourself. They help you make your dreams or goals more tangible and solid. You form an energetic bond with what you really, really desire. 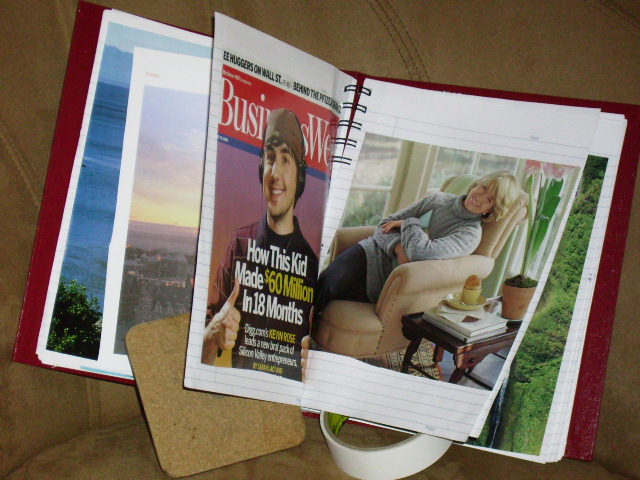 Vision boards can act as guiding lights or north stars – helping you realize and commit to your Vision. They are fun and creative to do, however they are also very powerful magnetization and manifestation tools. Acting as little energy vortexs if you will – that tell your sub-conscious mind what to go out and bring to you. Like an order form to the universe (or whatever you want to call it). How do you create a Vision Board? It very simple and fun. Collect together a pile of magazines, a pair of scissors, a glue stick (or tape), and some markers. You’ll also need some sort of sturdy backing (like a poster board, large sheet of paper … even a few paper bags cut open and taped together will work). Give yourself about 30-45 minutes, in a quiet, enjoyable space. With all your materials around you – set the intention that you are going to create a vision for yourself using all of these materials. That you will flip quickly thru these magazines and find images and words that really jump out at you. That you have an emotional connection with. You may or may not want to create a time line for your vision (meaning: you may want to state the timeframe that you want to reach this vision by: i.e. 6 months, 1 year, 3 years, 5-10 years … whatever feels right for you. or, if no timeline feels right, just call it your ASAP Vision). After setting this intention, you dive into your magazines. Using your intuitive (not your rational mind) to find images that resonate with you. Just rip out whatever jumps out at you, piling them off to the side. Do for about 15 minutes or so, or whenever the energy kind of slows down. Once you’ve got a nice stack of images … turn next to assembling them onto your poster board (or whatever backing you are using). There is no wrong or right way to create one. Just do what feels right for you. You might want to arrange your images and play around with them a bit … then finally tape or glue them down. Ok, I’ll be vulnerable, here is one of mine from about 6 months back (I was going through an appliance envy stage). Click for larger view. After creating your Vision Board, you might want to debrief the experience a bit and harvest out what you have learned about your Desired Future. I call this “Extracting the Essence”. I’ve created a map that I use with my clients to do this. After creating their vision, they share it with me (or if we are in a group, with the group) and together we extract out the main meaning that their images hold for them. See Essential Extracts map below, with the two columns on either side of essence words (this one courtesy of my very cool client, Erik H. – thanks Erik!). One other quick idea. You can also do this kind of collage work using a workbook or notepad. Just clip out images and paste them on pages of your book. This way you can travel easily with them. Below is a snapshot of my Vision Book, that I take with me when I travel (I like adding in hotel and travel images and other things that catch my eye and it brightens my mood to flip through my Vision Book when I have a spare moment – keeps me aligned and on track about what I want). P.S. 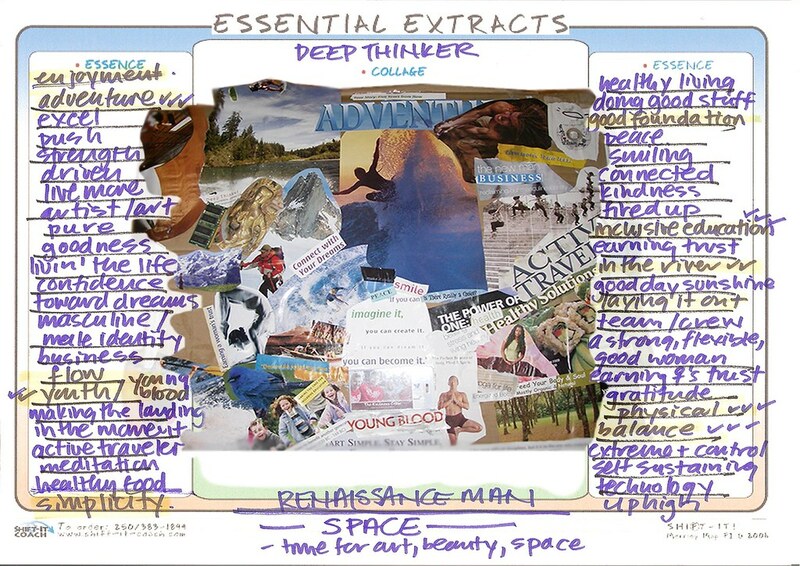 If you’d like more information on how to do a Vision Board, I’ve got instructions and the Essential Extracts map all rolled into one easy downloadable package: see Essential Extracts booklet. P.P.S. Or, check out my full SHIFT-IT Home Retreat Kit … not just Vision Boarding, but a whole process that will help you do you FULL past, present and future thinking … as well as action plans, etc for making it happen! More Info Click Here. P.P.P.S. 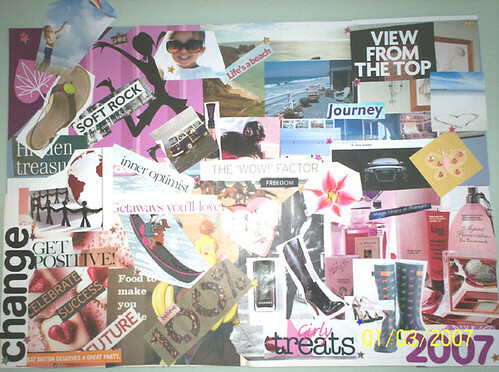 And, check out a much more recent blog post that shows five more Vision Boards: Click Here to View More Vision Boards.